Install our dwMap app on your Garmin watch, or our routeCourse app on your Edge. The first time you start the app, it will show an 8-character code, which you enter here to securely link the app to your online account. Before you enter the code, create your free account. 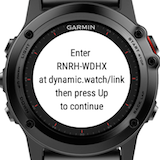 dwMap runs on the Garmin Vivoactive, Vivoactive HR, Vivoactive 3 or 3 Music, Forerunner 230, 235, 630, 645, 645M, 735XT, 920XT or 935, Fenix 3, Fenix 3 HR, Fenix 5, 5S or 5X, Fenix 5 Plus, 5S Plus or 5X Plus, Fenix Chronos, Approach S60, D2 Charlie, D2 Bravo, D2 Bravo Titanium, Descent Mk1 GPS watch watches. routeCourse runs on the Garmin Edge 520/520 Plus, Edge 820/820 Explore, Edge 1000/1000 Explore, Edge Explore or Edge 1030 cycling computer, Fenix 5/5S/5X, Fenix 5 Plus/5S Plus/5X Plus, Forerunner 935/645/645M or Descent Mk1 watch, Oregon 700/750/750t or Rino 750/755t GPS.